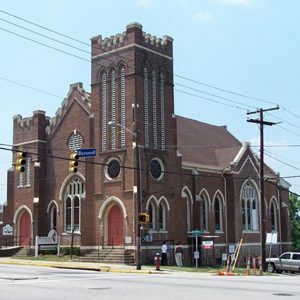 Wesley Methodist Church is the oldest African American Methodist congregation in Columbia. It was founded in 1869 by Rev. J.C. Emerson and was a separate black congregation instead of forming from an established white church. First called the Columbia Mission, it met upstairs in a Main St. building and later built its own chapel. About 1910 the Columbia Mission bought this lot and was renamed Wesley Methodist Episcopal Church. This Gothic Revival church, built in 1910-11, was designed by noted Columbia architect Arthur W. Hamby. Its high-style Late Gothic design is relatively unusual for an African-American church of its period.